Though I arrived here on the shores of California ;) twenty-two years ago, in a car I'd bought with my United States Postal Service wages...Toyota Corolla four-door sedan, dark blue beneath a glaze of golden dust from Tennessee, Arkansas, Oklahoma, Texas, New Mexico, Arizona, and the California desert...with four thousand dollars' worth of travellers checks in my purse...absence does make the heart grow fonder. I haven't been back to Virginia since then, but I was looking for photos of Norfolk online the other night. 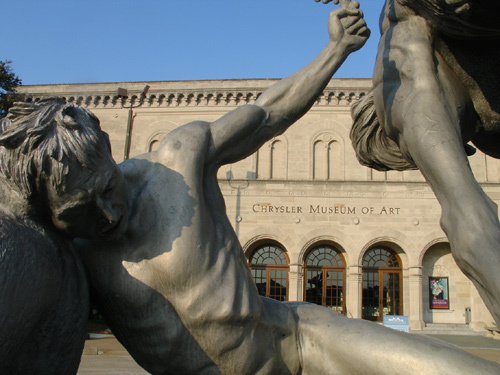 The funny part of this image of the Chrysler Museum is its perspective. I suppose it was meant to be taken at an artistic angle, but this is the statue as I used to see it...the statue is on a round platform. I'd like to say the platform is towering, but in all likelihood it's only a few feet high. Keeping in mind we had nothing better to do--no computers, cable television, VCR's, some people still had black-and-white tv's--the neighborhood kids used to climb this statue. I've climbed it myself many times. There's a little garden to the right, which had an iron fence. If you were young enough, you could squeeze between the rails of this fence and visit the garden when the museum was closed. I still remember the day I became too old to fit through. The complete statue has a horse with a guy on it, reaching down to the guy on the ground. The little kids used to climb on the head of the guy on the ground (or technically, on the loop his other arm made), while the more daring climbed onto the horse itself. A few maniacs used to go all the way to sit on the horse's head.